It’s important for seniors to stay active during their golden years, both physically and mentally. To help your senior loved one lead a more active lifestyle, Rhode Island home care agencies recommend the following local activities. Roger Williams Park is a beautiful place to walk under the changing leaves during the fall season. The location boasts a nature museum where seniors can check out scientific specimens and explore new exhibits throughout the year. Over 427 acres are available to walk through, including a zoo that is also open to the public. Seven different lakes are also available for guests who like to feed the resident ducks or rent boats. Walk through a living museum at the Rose Island Lighthouse, which was originally built in 1870. Once here, guides will explain the rich history of the attraction to eager history buffs. Travel by water taxi and watch sailboats pass by before stepping foot on the island. Guests can even choose to spend a night at the lighthouse and wake up to panoramic views of the water in a secluded and quiet setting. Seniors will step into the 1920s when they visit the Providence Performing Arts Center, which first opened its doors in 1928 and still features formal decor from that period. Seniors can attend award-winning performances that include Wicked, Once, and A Gentleman’s Guide to Love and Murder, not to mention other notable events that are hosted throughout the year. The Herreshoff Marine Museum features a vast collection of sea vessels that have been restored to their formal glory and are on display in a waterfront complex. The museum is dedicated to the history of the Herreshoff Manufacturing Company and is home to over 50 different boats. There’s even a collection of boat hull models, artifacts, and memorabilia that give guests a greater appreciation of sailing and the beautiful construction of each vessel. 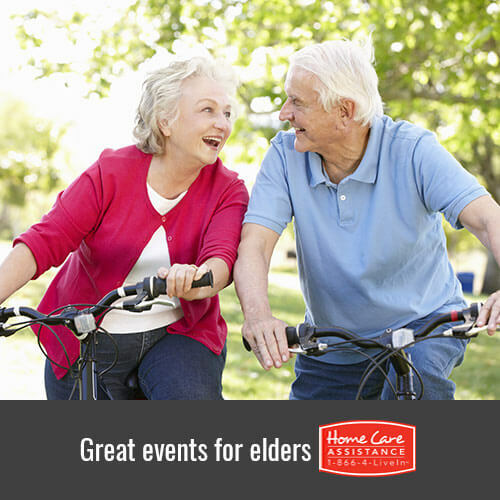 With help from Home Care Assistance, your loved one can take an active part in local activities on a regular basis. We provide flexible stroke, Alzheimer’s and dementia home care Rhode Island seniors need in order to boost both vitality and longevity. Learn more about our services and how they benefit our clients by calling (401) 284-0979 today.